I'm a 1 person indie app developer who makes cool AR apps. I've actually been doing this since 2010, though many of my older apps have been pruned. 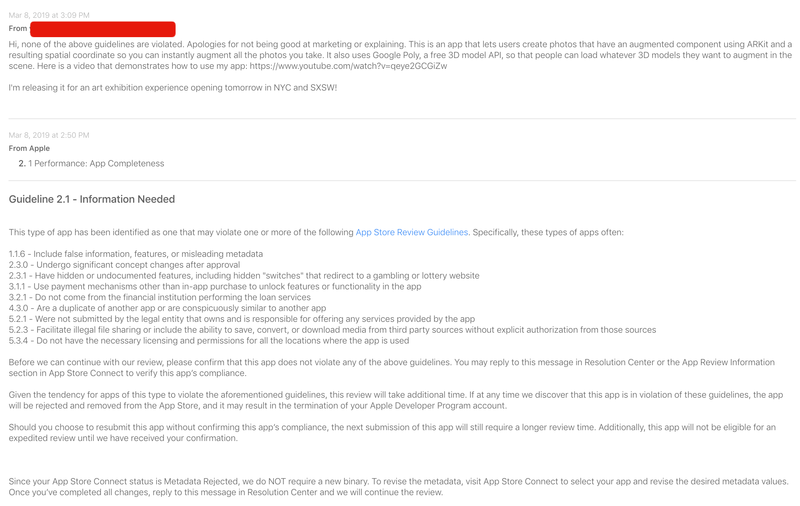 It seems that every time I submit an app to the App Store, it gets blacklisted or put in some sort of queue where the review process is either managed by people who are completely non-technical, or trying really hard to witch hunt an innocent person. This is after I have responded explaining several times that my app is not in violation. Moments.Cam is a new type of camera app that lets you take photos and turn them into portals that float there. Powered by ARKit: They're spatially floating photos that will stay forever exactly where you took that photo! You can also use it with Google Poly, a 3D model API, to search for 3D models and build digital sand castles that you can take spatially floating photos of in augmented reality! Please escalate to your supervisor - I believe there is some misunderstanding Please note that Google Poly is not Google Play. As explained in the App Description, Poly is an API provided 3D models based on search terms. They both start with a P - but please don't get them confused. The app used ARKit and does not require a marker. Please follow directions in the app and wave your phone around to scan the world like a typical ARkit app. I've added additional screenshots that show this. Here is a video that demonstrates how to use the app: https://www.youtube.com/watch?v=qeye2GCGiZw The app does come with built-in instructions to guide the user to scan the ARKit surface to the point where content can begin... Please spend more than a moment before you judge my app as something else. Thank you. First of I would say that it looks like a really nice app that you have produced! To answer your question: No, I don't think developers are "blacklisted" into having their apps rejected with bogus reasons in order to "bog down" the developer and eventually having them give up on gettings their apps released. Also, I don't think that you're assigned a specific reviewer that is on a witch hunt for solo developers or anything like that. However, I do think the realities are that app reviews are done in a very short time frame, and some times the reviewers do not really spend the time necessary to fully understand what a app does - and instead they reject it to be "on the safe side". Also I think the realities are that it is not necessarily the same person reviewing the app each time, so they might not know the history you have. In order to do something practical and sensible about this, I don't think you'll get anywhere by complaining to Apple that you're being targetted. Instead try making smaller changes to the app and/or description to acknowledge that you're listening to what they are saying (even if you do not agree), and see if that can lead to the app being approved. For example remove the reference to Google Poly from your app description, and instead change it something neutral like "use it with the most popular 3D modelling API available" or something like that. Then inside your app, you can describe that it is Google Poly. Similarly try adding an initial intro screen to your app that in simple terms describes how your app works. Make sure NOT to mention QR codes. For example do not say "This app does not require QR-codes". The reviewer might quickly glance at the text and only see "QR-codes" and then reject the app because they haven't gotten a QR-code to test with. "Never attribute to conspiracy that which is adequately explained by incompetence." Apple regularly gets it wrong, and there have been a number of high-profile cases where devs get knocked back for the wrong reasons. Stick with it, and I'm sure it will get sorted. Based just on reading the responses, I think you need to replace: "You can also use it with Google Poly, a 3D model API," with "You can also use it". You aren't allowed to refer to Google in your description like that. Also (I didn't download the testflight app, so this might be incorrect) you need something on first run to tell people how to use the app. I think the reviewer is saying you can't just have your app show up as a camera with no explanation in the app as to what is going on. You can't assume people read app descriptions. If you do have something like this, I'm guessing it is too subtle for the app reviewer. Or there is a sad path where you can get to the camera without seeing it. Those don't ask the question in the title, so I guess... No. Not the answer you're looking for? Browse other questions tagged ios-appstore app-store-connect . Is there a standard delay for consumer ratings of apps on the App Store? How to react on Appstore rejection of screenshots? What constitutes “significant changes” when releasing a new TestFlight build that has passed beta review? Did Apple remove their Export Compliance advice? Does the iOS app store accept apps that don't work unless the user pays via a subscription or IAP? What are the App Store fees for subscription to an IoT hardware product?